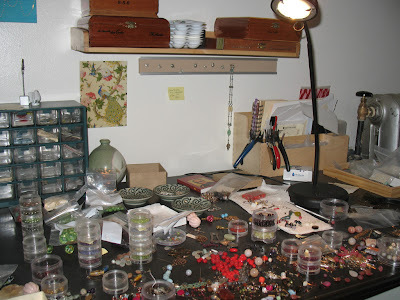 As a follow-up to her interview yesterday, we now get a glimpse into Amy's jewelry-making process by looking at her workspace in progress. "I am working on a few custom orders and trying to meet holiday deadlines!" Tune in next week for another Workspace Wednesday and remember to BUY HANDMADE for the holidays by visiting the shops of Boston Handmade members - click on the links in the right-hand column of this blog! Now that is a workspace I can relate to!